Fenbendazole mixes with your furry friend's food. If your furry friend has been experiencing tummy upset, it's possible she might be infested with internal parasites. To rid her of these internal pests such as intestinal worms, your vet may prescribe medications including fenbenadazole, a drug you can feed her. Fenbendazole is a type of medication known as an anthelmintic. Such drugs kill off internal parasites by affecting their metabolism and starving them of nutrients and the ability to survive inside your kitty's body, according to the petMD website. Fenbendazole kills many types of intestinal parasites that can infest your feline, including roundworms, whipworms, some tapeworms and hookworms. It helps to eliminate strongyloides, also known as threadworms, from your kitty's intestines as well as some types of lung and bronchial tree parasites, according to PetPlace.com. Fenbendazole may treat giardia infections, but it's not always successful, according to a study published in the August 2003 edition of the "American Journal of Veterinary Research." Although fenbendazole is not approved for use in cats by the U.S. Food and Drug Administration, your vet may prescribe it off-label to treat your kitty's intestinal parasites after he diagnoses her condition. According to a study published in the March 2000 edition of the "American Journal of Veterinary Research," fenbendazole had no ill effects when used to treat cats. This was true, in the study, even when kitties received doses three times larger than recommended by the manufacturer. While fenbendazole is considered safe for kitties, give it to your friend only if a vet prescribes it for her, and follow his instructions regarding the dosage. Fenbendazole typically comes in powdered or tablet form to give your furry friend. If your kitty won't eat the tablets directly from your hand, crush them with a mortar and pestle to make a powder. 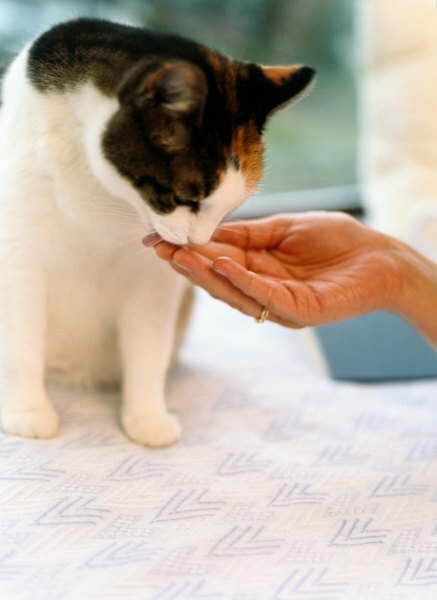 Mix the dose of powder or tablets your vet recommends into some canned food for your kitty. The dose is usually based on her weight, approximately 50 milligrams for every 2.2 pounds, according to MSD Animal Health. Feed her the food and, if there is any leftover, save it in the refrigerator for a second feeding during the day. Follow your vet's instructions for dosage and length of treatment. 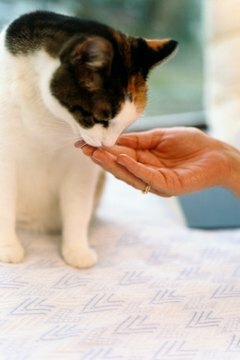 Typically, your kitty will finish her medication within three to five days, although she might need another course of the treatment within a few weeks. Fenbendazole is one of several types of medication your vet might prescribe to treat your cat's internal parasites, depending on the types she's suffering from. Fenbendazole has some mild side effects, including upset tummy and vomiting, according to the VetInfo website. You might also find dead parasitic worms in your feline friend's feces. This is normal; it just shows that the medicine is doing what it's supposed to do -- free your feline of those internal pests. Even if you see your kitty doing better after a dose or two of fenbendazole, don't stop the medication until you've completed the full course of treatment, or some of the parasites might survive in her system. Have your furry friend retested for intestinal parasites after treatment to see if a second treatment might be needed. Consult with your vet regarding the treatment of pregnant kitties, or kittens under 6 weeks old, who are dealing with parasites, as fenbendazole might not be safe for them, according to petMD. VetInfo: How to Administer Powder Form of Fenbendazole? How Often Do You Give Droncit Feline to Cats? Is Flagyl Effective for Cats?